GREEP BOINK MEEP! The three little aliens are happily settling into their new homes when the Big Bad Robot flies in to crack and smack and whack their houses down! A chase across the solar system follows in this out-of-this-world version of the classic Three Little Pigs tale. Margaret McNamara (How Many Seeds in a Pumpkin?) 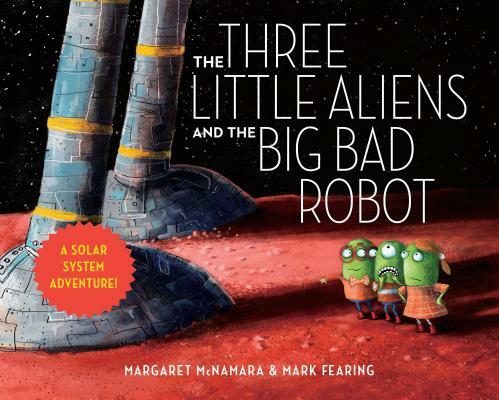 and Mark Fearing (The Book that Eats People) have created a humorous and visually stunning story that kids will adore--and that will introduce them to the planets and the solar system. And with an abridged text, this board book version is perfect for even the youngest readers. MARGARET MCNAMARA is the author of How Many Seeds in a Pumpkin?, called "illuminating" by Family Fun magazine and recommended as "a first-purchase consideration" by School Library Journal. She is also the author of the popular Robin Hill School early reader series, one of which, The Pumpkin Patch, was awarded the Oppenheim Toy Portfolio Best Book Award-Gold. She lives in New York City. MARK FEARING has created award-winning editorial cartoons, animated shorts that have appeared on Nickelodeon and G4, and was a production manager for Walt Disney Television Animation. He is also the illustrator of The Book that Eats People by John Perry, called "irresistible" by Publishers Weekly and a "hilariously dark story" by School Library Journal. He lives outside Portland, Oregon. Visit him at MarkFearing.com.